Beautfiul casual look. I love the trench and the cute red Hunter booties! Looks great with red hunters! And what a lovely dog! That trench coat is beautiful! I love your bright red hunters! And your doggy is so cute! love how simple and chic this outfit is! Perfect coat and sunnies! You look lovely in this comfy, laidback outfit! 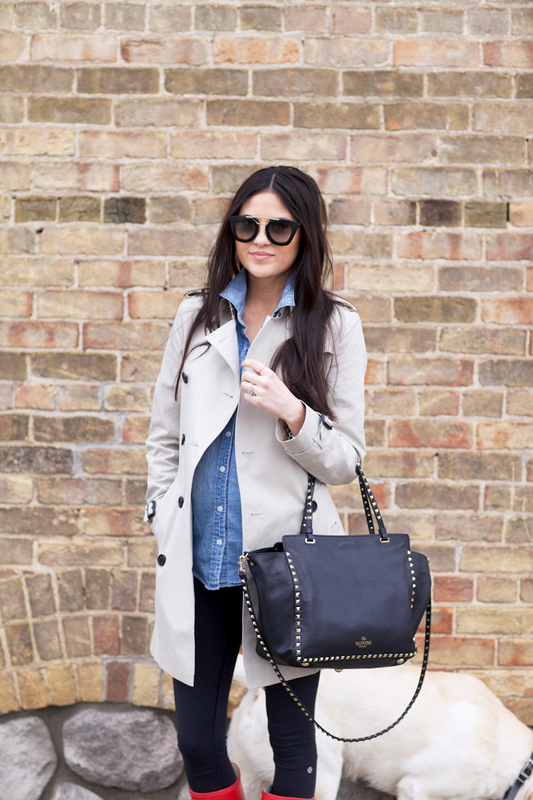 The trench is the perfect round up for this casual outfit. Loving a good effortless look. Pure perfection! I love the red accent and unique Prada sunnies! Cute! Love the boots with the neutrals! I love this rainy day look! That trench is so pretty! I love the pop of color given by your Hunter boots! Your Burberry trench is beautiful. It’s such a great timeless piece. Love the simplicity of this look Rach. What a cute layered look! Your hair looks gorgeous too. I love the natural wave to it! Love this easy and simple look! The red Hunter’s are a great pop of color! Love this casual look on you. Your coat is beautiful! The red rain boots are adorable! What a perfect outfit for everyday! I love this look! Dash is such a cutie!! love your Hunter boots! Love the look!! It’s been pretty rainy here as well and i hate it!! but definitely want to try a similar look!! Simple and classic! Dasher looks like he’s having a blast! I love these red Hunter! You puppy is always beautiful! I’m in love with that coat!! It’s perfect – and the boots! Just loving the outfit haha.. And your pup is so adorable! It’s been rainy and gross on the east coast too! I love this classic rain look! I keep eyeing those glasses and feel like I need to pull the plug and buy them They’re just too good! Cute casual look for a rainy day! Adorable! I love the color of your boots!! Love…love…love the raincoat with the Hunter boots. Great rainy day outfit! Love this rainy day look! The Burberry is Amazing and Dash is too cute! Hey Rachel! Love your rainy day, laid back look. Those red Hunter’s are gorg! Love this classic look! That trench and those sunglasses are perfect! Classic, chic, and comfy rainy day look!! Awe Dash is so stinkin cute! Love this trench with the pop of red! Such a classic look. Love your sunglasses and trench coat! Looking beautiful! Our labradoodle is the same way! 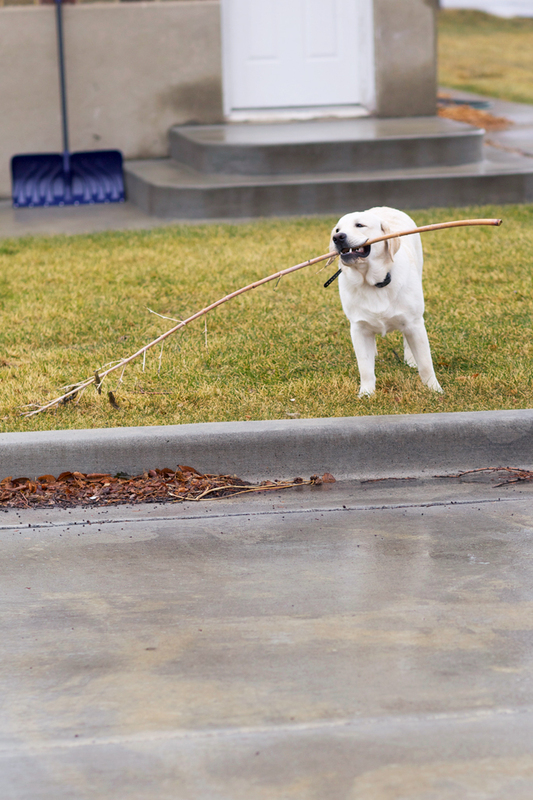 He will pick up the largest and longest branches and try to carry them everywhere. hilarious. I love your Hunter boots!!! Mmmm those red hunters are classic. I really need to bite the bullet and grab a pair, especially in rainy Savannah. Can’t decide between red or hunter green though! I love the Valentino bag! Loving those Hunter boots, as always! Obsessed with your Hunter boots! Super cute outfit! hahahaha dasher! thats so funny! my fiancé wants a puppy so bad! Lovely look. Your hair looks amazing. Love this look. The red hunters and trench go perfectly! Simple, chic and perfect! Absolutely love these sunglasses and rain boots! Great play on neutrals and the rain boots. Love the simplicity of this outfit. Debating getting a second pair of Hunters…. Perfectly stylish look for a rainy day! Simple and classic. I really need to pull the trigger on the red hunters. Do you like having the matte ones versus the shiny? Check out and follow my blog. I love your British combo of your Burberry coat and Hunter Wellies! You look beautiful the glasses suits you so well! So sweet! That pup of yours is such a cutie! And I’m loving the boots! Perfect look! Love everything about it! LOVE your red Hunters and your classic trench and chambray top! Great combo! Love this casual look. Perfect yet chic for a rainy day. I absolutely love this look partially because I’m obsessed with Chambray! cute! this is so nice and casual! Dasher is such a cutie! Love the red Hunter boots! I love the red Hunters!! I am loving this casual look, it looks relaxed. Perfect rainy day look! Lululemon leggings and Hunter boots were essential when I lived in Seattle! I love how the trendy trench makes the outfit look dressier. Hi, I have been trying to get a hold of you for a while! I’m wondering where your ginger jars are from in your entry on the table? With the little flowers? I love! Also, where do you buy your hangers for sweaters? Please please get back to me! Thank you! I get my hangers from Bed Bath and Beyond. Love how stylish you’ve been through your pregnancy so far. You look beautiful! And I love those sunnies. I found you mentioned in a magazine and glad I did – really liking your style and photos. Love your trench. How is the sizing? Do you find it true or small?